For an extra special Feast of Saint Valentine, put out a spread of succulent lobster tails, sea scallops and sizzling steak for your favorite valentine. Preheat the grill and clean the cooking grate. Defrost the lobster tails, then choose your favorite recipe and prepare the lobster meat. The prep time will be about 10 minutes and the actual grilling time will be 7 to 11 minutes. Turn the tails over and grill until the meat is white and firm but not dry, 5 to 8 minutes longer, brushing occasionally with melted butter. Remove from the grill and serve warm with the reserved butter on the side. Choose your favorite type of steak—rib eye, porterhouse, top sirloin, flank steak, or maybe a small filet mignon. Grill direct/high to medium heat. The prep time will be about 15 minutes and the actual grilling time will be 6 to 8 minutes depending on the thickness of the meat. 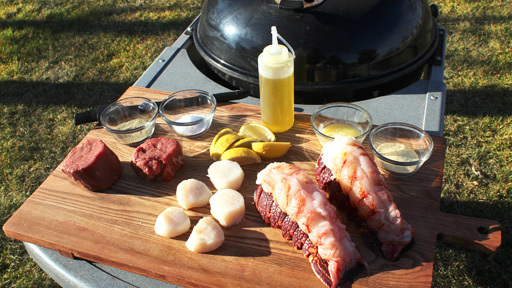 The size of the scallops you choose will determine whether you grill them on the cooking grate or on a griddle. You can grill larger sea scallops on the cooking grate 1 to 2 inches apart at direct/high heat until just opaque in the center, 4 to 6 minutes, turning once halfway through grilling time. If you choose smaller scallops, brush or spray the scallops with olive oil. Place on the griddle 1 to 2 inches apart and grill direct/high heat until just opaque in the center, 4 to 6 minutes, turning once halfway through grilling time. Remove from grill, sprinkle with garnish or sauce, and serve warm. Finish with freshly mashed potatoes and vegetables and this will be a dinner your valentine never forgets.